Local author Les Roberts has now written 13 mystery novels and they are all set right here in Northeast Ohio. He has 9 books in his series centered around Slovenian-American Cleveland Private Detective, Milan Jacovich. Jacovich (pronounced with the authentic Slovenian "y" sound not a "j" sound) used to be on the Cleveland Police Force before becoming an independent. Now he relies heavily on friends and contacts he made in school and while on the force. His good friend Ed Stahl is a reporter for the Plain Dealer, Mark Meglich (previously Marko Meglich) is his connection on the force. He also calls on old friends in the banking industry and any number of others to help solve his cases. He is a divorced father of two with very strict principles and values that he applies to everyone he meets. It is refreshing to read stories set in places we all know - The West Side Market, Cedar-Fairmount, Shaker Heights, Murray Hill, and Pepper Pike. It is also great to read his references to Cleveland "habits" such as the ethnic restaurants and watching the Browns on Sundays. He hangs out in places with names like Vuk's and Janko's and eats klobasa sausage fried in olive oil with green peppers and onions. And he drinks Stroh's; not fancy wine or even high end beer. He did make at least one stop at the Great Lakes Brewing Company where he drank the Burning River Ale. As he says, he doesn't like the name being a reminder of a negative that happened over thirty years ago, but he likes the way it tastes. The plots are interesting though some times a little see-through. But even if you can figure out what is going on early in your reading you will want to continue. Roberts takes you on an interesting and exciting ride through the streets of Cleveland and its suburbs; in places some of us go daily and in places some of us would never dare enter. 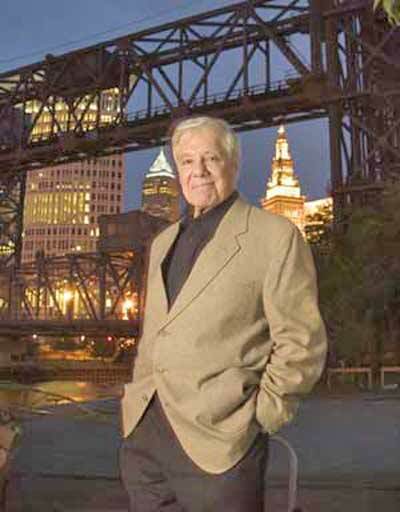 If you have ever lived in Cleveland, you will want to read his books. If you enjoy a good story line, you will want to read his books. If you just like to read interesting mysteries, you will want to read his books. Les Roberts is a talented author who has created a character one can not help but identify with and root for. His books are exciting and fun to read and I would recommend them to anyone on your gift list.